The Attorney General’s Office said he fostered a discriminatory company culture. But Mukilteo aerospace entrepreneur Peter Zieve — who last year donated $1 million to Donald Trump — is now making his own political run. 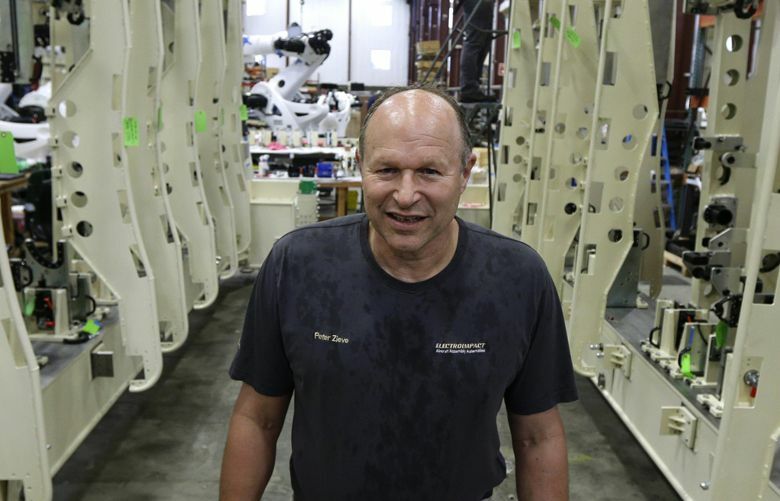 Last year, Mukilteo aerospace entrepreneur Peter Zieve gave $1 million to support Donald Trump’s presidential campaign, becoming one of the New York billionaire’s top donors nationwide. This year, Zieve has stepped into politics himself. The 63-year-old founder and president of Electroimpact — a major supplier to Boeing and Airbus and employer of roughly 800 people around the world — is running for Mukilteo City Council. “It seems like he aims to be the Donald Trump of Mukilteo,” wrote local resident Diana Kushner in a letter to the Mukilteo Beacon, one of many Zieve’s candidacy has generated in the city of roughly 20,000 near Everett. She noted that he dismisses criticism as “fake news,” like the president, and last year infamously mailed anonymous postcards alerting city residents to plans for a new mosque. He has since apologized. But his expression of anti-Muslim sentiments, which for years helped shape Electroimpact’s company culture, goes way beyond the postcards and would seem to make him an unlikely political prospect. In emails circulated at work, he suggested that Middle Eastern refugees are “terrorist savages” and encouraged his mostly white, male workers to marry and procreate so this country won’t be “backfilled with rubbish.” Those who followed his advice received bonuses. In March, after the state Attorney General’s Office found that Electroimpact discriminated on the basis of religion and marital status, the company entered into a consent decree that required it to pay $485,000 and take Zieve out of direct hiring. Some consequently find his council campaign alarming. “He’s already created a lot of discord,” said Kim Longmore, a local teacher who said she hadn’t been political in the past but decided she needed to “step things up” when she heard Zieve was running. Court and police records show that Zieve and his wife, Mariya Morozova-Zieve, have had volatile arguments over the years, with officers called to their home a half-dozen times, once by a child saying “mom and dad were fighting,” according to the 2014 police report. Longmore, who has read the police reports, said it’s impossible to know the whole story about allegations of aggression by both parties. Neither Zieve nor his wife could be reached for comment over the past week. His estranged sister, Wendy Zieve, calls his campaign “kind of bizarre.” She referred to what she believes is Electroimpact’s desire to keep her brother out of the limelight after the PR nightmare of the past year. There are other oddities. Mohammed Riaz Khan, head of the group building the mosque Zieve wanted to stop, said his onetime nemesis sought his endorsement, as well as help with mediating his marriage problems. Khan, who is running for a different council seat — Zieve is challenging City Council President Bob Champion for Position 2 — said he turned the entrepreneur down on both counts, as he did when Zieve offered a campaign donation. Zieve has some prominent endorsements, including current and former local officials. Yet at least two of them aren’t exactly full-throated. “I endorse everyone that asks me,” said Councilmember Scott Whelpley, one backer Zieve lists on his campaign website. “Everyone.” It’s something he does to show he can get along with all sorts. “You understand I’m a minority, Peter,” Whelpley said he told Zieve when he asked for an endorsement. Whelpley, a Navy veteran, said he looks like a “tall white boy,” but is half Mexican. The deal was done, even though Whelpley said he completely disagrees with Zieve’s views on people of other races and religions. After all, Whelpley said, even Hispanic members of his own family sometimes utter racist remarks. Whelpley also said he appreciates what Zieve has done for the community, including donating $200,000 for the Boys & Girls Club’s planned construction of a new facility in Mukilteo. Former two-term Mayor Joe Marine has another reason for his endorsement of Zieve. “I felt that I owed him that support,” said Marine, explaining that Zieve had always endorsed him and contributed to his campaigns. Marine, an insurance salesman, said he’s gone to some of Electroimpact’s elaborate Christmas parties and been impressed by what he saw as a “huge family atmosphere.” He added that Zieve would bring a business perspective to council. Marine said he also wonders why Zieve would even want to be a council member, a part-time, nonpartisan position that offers a monthly $500 stipend. Zieve’s website also talks about adding new playgrounds, eliminating permitting requirements for home improvements, and enacting “legal force” to stop “transient and criminal populations” from moving into Mukilteo. He draws a distinction between “genuine homeless people” and people “exploiting” services for them. His campaign site does not mention the planned mosque. Zieve told The (Everett) Herald he no longer opposes the project. Zieve spoke against a resolution put forward at a June council meeting to make Mukilteo a “welcoming city” to immigrants and minorities — a rhetorical measure that carried no policy changes and stopped well short of typical “sanctuary city” legislation. The meeting was contentious, but Zieve talked only briefly and said nothing memorable, according to Councilmember Richard Emery, who sponsored the ultimately successful measure. Zieve will have a chance to elaborate on his views at a Monday evening candidate forum at City Hall. One person who wrote in to the Mukilteo Beacon to support Zieve is his wife. To police officers and in a 2011 petition for a protection order, Morozova-Zieve, 45, has expressed fear and anger regarding her husband. She said he was cheating on her, called her ugly names in front of the children, repeatedly pushed and grabbed her and, one time in 2011, sprayed Windex in one of her eyes. Zieve told an officer he was aiming for windows, not her, but he was arrested on a misdemeanor assault charge and spent a day in jail. As recently as February of this year, Morozova-Zieve also was arrested for assault and booked into jail, following a fight in which she allegedly scratched Zieve’s hand and bit his arm. Both those cases — rare occasions when either party claimed physical violence — were dismissed, and Morozova-Zieve emphasized the lack of convictions in her letter to the Beacon. Zieve, in his own letter to the Beacon, seemed to suggest that his family problems were due to a brain tumor his wife has had since 2001, which caused her to lose control of her emotions. “Our family is closer together than it has ever been,” he wrote. 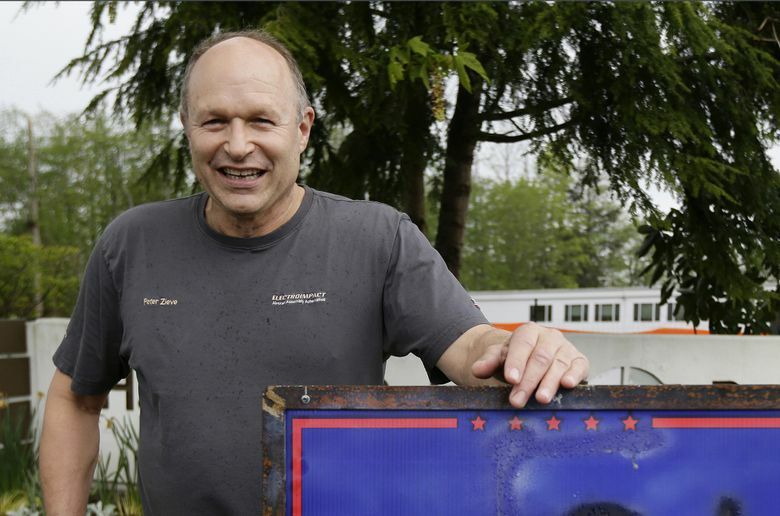 Zieve has put $50,000 of his own money into the campaign — a fortune in Mukilteo politics. “That buys a lot of things,” said Champion, who also works in aerospace, as a staff scientist specializing in in-flight safety equipment at Honeywell in Redmond. His self-funded campaign war chest totals $5,000. Even so, Whelpley said he doesn’t expect Zieve to get through the Aug. 1 top-two primary, though he noted a faction of people in town quietly agree with Zieve on matters such as immigration. That may lead to Zieve having something else in common with Trump.